Flying Carpet is one of the largest online travel agencies in Israel, and I work in the capacity of its Marketing Manager. Since 1988, Flying Carpet has evolved into a prominent travel and tourism brand which operates on multiple levels. From providing overseas holidays to residents of Israel, to promoting inbound tourism in international markets, we have a vast array of services within the travel and tourism niche. Our website flying.co.il handles flight and hotel bookings, full vacation packages, as well as select offerings such as cruises and family-friendly holidays. We also provide information on routes, destinations, and sightseeing or adventure activities. The visitor demographic on our website includes young travelers under the age of 25, as well as families and corporate groups looking for specific tour packages. We offer an extensive range of travel-related services, each of which poses unique challenges. But our biggest challenge by far has revolved around increasing the number of sales we make through our website, i.e., getting travelers to book more vacations, deals, and flights through flying.co.il. As one of the country’s leading travel agencies, our brand image is very important to us. As a result, we have been spending a great deal of time and resources in growing our customer base and keeping in touch with our existing users. Over time, we have learned to recognize the limitations of standalone marketing campaigns and promotions, especially considering the new audience of millennials that we are now catering to. We needed our website itself to be more geared towards generating more leads and turning them into paying customers. Creating a chatbot on our site promised us that. We added a VirtualSpirits chatbot to flying.co.il, so we could attend to more travelers, answer their questions, and point them to the right information and offers. 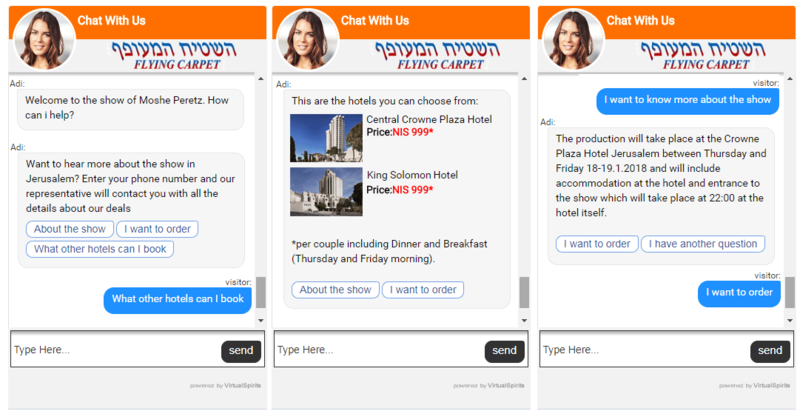 We wanted a chatbot that would scan the agency website when prompted by a visitor, and fetch up-to-date details on vacation deals, flights, hotels, hot destinations, and even travel tips and guides. Doing this, we figured, would increase our visitors’ chances of booking with us, and encourage them to return to us every time they wished to plan a holiday. The addition of a VirtualSpirits chatbot has shown great results on our website. Ever since the chatbot went live, we’ve noted that most of our holiday package sales and flight bookings have come from visitors who had a conversation with our chatbot. And on looking at records of these conversations, we could see that the chatbot was able to provide specific answers to a variety of questions that the visitors asked, helping them figure out where they would like to travel and which flights and hotels they should book. This is a boon for a travel agency as big as ours. We no longer end up losing potential customers just because they didn’t have the time to manually go through the destinations, flights and vacation packages listed on our site. Now when a traveler visits flying.co.il, they can just ask their questions in their own words and find out about the latest deals and discounts on flights and hotels, information on attractions and activities, and a lot more. This has also reduced the lead time for the average booking process, because visitors get all the details they need in a few short seconds. I would recommend launching your chatbot as soon as possible. Don’t delay the process in an attempt to make everything “perfect” before the launch. We know now, from our own experience with using chatbots, that a good chatbot is one that learns all the time, especially as it has more conversations with real visitors and gathers more feedback from them. I remember how while configuring the Flying Carpet chatbot, I would sometimes get stuck on trivial things, on parts of the chat script that weren’t perfect in my opinion. But as soon as the chatbot started talking to real visitors on our site, I realized that I had essentially been wasting time on unimportant issues. And the visitor interactions were actually pointing us towards what was actually important. Because at the end of the day, our chatbot had to be able to address what our visitors considered important – not what we did.